And as most people know by now, its that it’s on Steam Greenlight. Well, what was I expecting for a news update about Cardfight!! Online? But it is something worth noting. At the very least, with Steam servers, there is a psuedo-guarantee that we will have global connection with the world for matchmaking. The link I posted above will bring you to their Steam Greenlight Page, where you can vote for it to be greenlit, if you have a Steam account. It is good, as it negates a need to create new accounts on some website. I do highly encourage that you greenlight this, if you would like.to see this game available on Steam. They may still need a lot of thumbs up. They’ve also updated their FAQs, which proved some of my speculations I had made in my previous update blog about Cardfight!! Online, which you can read right here. They are unable to reveal any further details about having access to all cards available. Which is fine by me. If it meant that they are focusing more on polishing the game itself, I’m okay with not knowing just yet, as there is still months to go before its aimed launch period. And its good that they answered the question of what we can expect, deck-wise, when we first open Cardfight!! Online, which is immediate access to the G series, with ways to obtain cards from the older sets. As I predicted, it will be in English and is based on English release dates for cards. Which is alright by me, as a Japanese player. But the best thing that I found in those FAQs is that they have planned for Cardfight!! Online Tournaments. TOURNAMENTS! That is a cool thing that ever “card game” based video game should have. This will be super neat, and if organised properly, will be super good, and is giving this game a plus. I was expecting more from their news announcement, such as gameplay footage. But this is okay to know, so long as that gameplay footage comes soon. I’v already thumbs up for Cardfight!! Online on Steam Greenlight, and I do encourage you to do the same, as I feel that with this approved, they will not be diverting resources to creating their own network, and instead focus on the gameplay, which is the utmost important thing the developers need to focus on. Cardfight!! Online is slated to be released late this year. 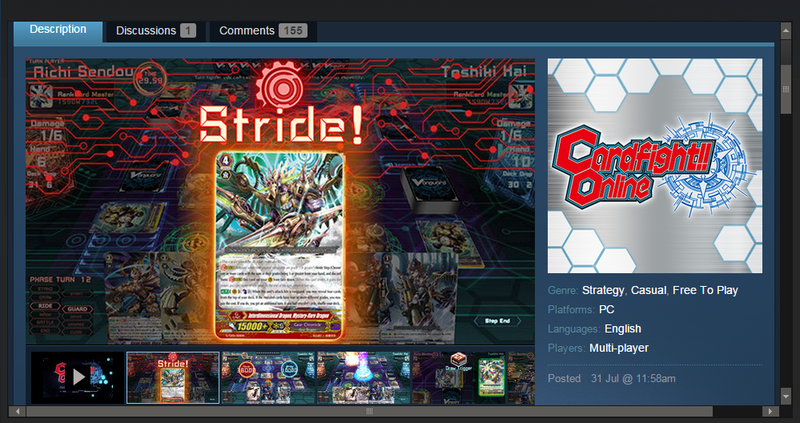 And we, here at Crossbone Vanguard, do intend to cover its release, as well as upload videos of our games on Cardfight!! Online on our Youtube channel.